BANGOR, ME- Earth Day fell on Friday, the 21st of April this year. To celebrate Mother Earth and protect our planet, Husson University held various events on campus to get students to really recognize what Earth Day is all about. There were multiple things to do on this day that would help cleanse the earth while having fun, as well. The schedule consisted of; a campus clean up, a barbecue, games, t-shirt tie dying, music, an e-waste pickup, recycling, a book swap, agricultural information, a seed giveaway, a gardening book raffle, chemistry student projects, viewing community art and painting projects, and so much more. This is only a taste of what happened on earth day of 2017. Adding to all of the fun students, staff, and the community had, they were also able to use this time of cleaning up campus as volunteer hours. Many students require community service hours and these events were able to be added to your resume. You could even go to the Campus Center at Husson University and sign up to get a free t-shirt on Thursday, the day before. It was a winning experience for everyone and an excuse to get outside after a long, cold winter. Events started at 10:00am and continued throughout the afternoon. There were various people who were involved in these events. Wynne Guglielmo and Julie Green ran the campus clean up at 10:00am and again at 2:00pm. Students and staff met up at the Campus Center before going to work. The English Club and Dr. Maria Cahill held a book swap at the Campus Center from 11:00-1:00pm. This provided used books to students who enjoy reading, rather than wasting paper by going out and buying a brand new book. Sarah Martin and Tom Stone also gathered with peers at the Campus Center to distribute agricultural information, a seed giveaway, and held a gardening book raffle. This also began at 10:00am and it lasted until 2:00pm. Husson University offers a gardening class for those who would like to know more on the subject. “I was the entertainment coordinator for the event. I reached to local artists to ask them to play, set up/ran audio for the music, and took photos,” said Nick Chmela, the secretary of the Students for Climate Justice Club. Chmela was in charge of the music that played during the barbecue. Chmela also mentioned that Kaile Kimball and Raquel Gibbs, the Vice President and the President of the club, were the coordinators of the event. 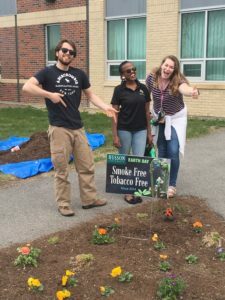 “Both of them attended multiple meetings over the course of the semester with the Husson sustainability committee, to help bring this event to life. We received the full support of the science department, in addition to support from dining services,” said Chmela. They also made sure to include academics during these events by presenting community art projects by the painting students and the Art and Design Club. Soil, air and water chemistry student projects were also displayed. Husson University made it possible to have fun and celebrate the earth.